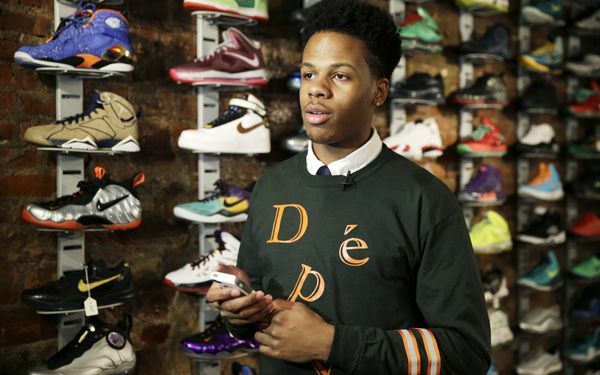 Chase Reed and his father, Troy Reed, opened Sneaker Pawn on Lenox Avenue in New York City's Harlem neighborhood, looking to capitalize on America's multi-billion dollar athletic footwear market, and the high prices sneakers can get being re-sold. The shop opened about six months ago and it offers different options. People looking to just unload their sneakers specifically basketball shoes can offer them to the Reeds to be bought outright, or they can leave the shoes for sale by the Reeds. That nets the Reeds 20 percent of the final sale price with the rest going to the original owner. Those looking to pawn their sneakers have two months to redeem them for the amount of money the Reeds forwarded them plus a storage fee. Shoes that are being pawned are held in storage and not displayed. The owner either gets them back or gives them up.